The hotel offers a restaurant. A computer station is located on site and wireless Internet access is complimentary. 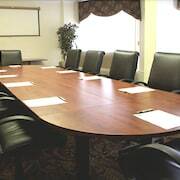 Business-related amenities at this 3-star property consist of a business center and meeting rooms. For a surcharge, the property provides a roundtrip airport shuttle (available on request) and a ski shuttle. This business-friendly hotel also offers laundry facilities, a grocery/convenience store, and ATM/banking services. Onsite self parking is complimentary. Continental Inn & Suites is a smoke-free property. Located in West Edmonton, this hotel is within 3 mi (5 km) of Palace Casino, West Edmonton Mall, and World Waterpark. Misericordia Community Hospital and Oasis Centre are also within 2 mi (3 km). A restaurant, a business center, and meeting rooms are available at this smoke-free hotel. Free WiFi in public areas and free self parking are also provided. Additionally, laundry facilities, a 24-hour front desk, and a computer station are onsite. All 96 rooms provide conveniences like refrigerators and microwaves, plus free WiFi and flat-screen TVs. Guests will also find coffee makers, free long-distance calls, and free local calls. Continental Inn & Suites offers 96 accommodations with coffee/tea makers and hair dryers. Flat-screen televisions are featured in guestrooms. Refrigerators and microwaves are provided. Bathrooms include shower/tub combinations and complimentary toiletries. Guests can surf the web using the complimentary wireless Internet access. Business-friendly amenities include desks and phones; local and long-distance calls are complimentary (restrictions may apply). Housekeeping is provided daily. Continental Inn Suites - This restaurant specializes in American cuisine and serves breakfast, brunch, lunch, and dinner. A children's menu is available. Open daily.